your lenses, so they feel fresh and moist for enhanced comfort throughout the day. When a contact lens is soaked in OPTI-FREE® RepleniSH® contact solution, the lens surface is reconditioned by a proprietary reconditioning system. This allows a thin layer of moisture from your natural tears to be maintained on the lens surface throughout the day. OPTI-FREE® RepleniSH® incorporates new ingredients to a disinfection system that has been used for over 20 years. Alcon continues to develop new technology to care for the new types of contact lenses available. This focus has allowed OPTI-FREE® RepleniSH® to continue to achieve a high level of disinfection against both bacteria and fungi. Always use the contact solution prescribed by your eye doctor. Ask us if OPTI-FREE® RepleniSH® is right for you. Remember, only your eye doctor can determine the contact lens and solution combination that is right for you. Think all contact lens solutions are the same? Think again. Contact lens solutions are different. Proper lens care plays an important part in helping your eyes stay healthy. 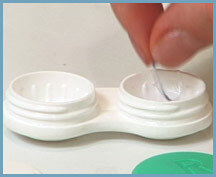 There are variations in the composition and characteristics among contact lens solutions. These variations determine the solution that is best for you. Not only should you avoid changing your contact lens solution prior to discussing it with your eye doctor, you shouldn't use another one from a friend or relative. Also keep in mind that other eye care products—like saline solution and rewetting drops—aren't designed to disinfect and recondition your lenses. You should only use the contact lens solution that your eye doctor recommends. Switching solutions may not properly recondition or disinfect your lenses. By using proper hygiene and following the correct steps to clean, store, insert, and remove your contact lenses, you can help your lenses stay moist and comfortable. Proper lens care plays an important part in helping your eyes stay healthy. OPTI-FREE® RepleniSH® contact lens solution helps maintain a shield of moisture between the lens and the eye, so eyes stay moist and comfortable all day. Additionally, this shield of moisture on the surface of the lens may help maintain the appearance of white eyes (free from redness) in many contact lens wearers. Use of OPTI-FREE® RepleniSH® has been shown to increase comfort for wearers of the most common soft contact lens material who experience discomfort. In addition, OPTI-FREE® RepleniSH® helps to maintain surface moisture, allowing many wearers to experience clearer vision at the end of the day.